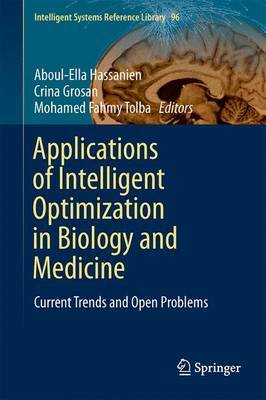 This volume provides updated, in-depth material on the application of intelligent optimization in biology and medicine. The aim of the book is to present solutions to the challenges and problems facing biology and medicine applications. This Volume comprises of 13 chapters, including an overview chapter, providing an up-to-date and state-of-the research on the application of intelligent optimization for bioinformatics applications, DNA based Steganography, a modified Particle Swarm Optimization Algorithm for Solving Capacitated Maximal Covering Location Problem in Healthcare Systems, Optimization Methods for Medical Image Super Resolution Reconstruction and breast cancer classification. Moreover, some chapters that describe several bio-inspired approaches in MEDLINE Text Mining, DNA-Binding Proteins and Classes, Optimized Tumor Breast Cancer Classification using Combining Random Subspace and Static Classifiers Selection Paradigms, and Dental Image Registration. The book will be a useful compendium for a broad range of readers-from students of undergraduate to postgraduate levels and also for researchers, professionals, etc.-who wish to enrich their knowledge on Intelligent Optimization in Biology and Medicine and applications with one single book.